The Panguna copper mine in the Autonomous Region of Bougainville of Papua New Guinea. Bougainville Copper Ltd. for 17 years before shutting in 1989 amid clashes that killed as many as 20,000 people in the autonomous region of Papua New Guinea. Now the company, known as BCL, is warning investors that legislation proposed by Bougainville’s government will make significant changes to its mining law, including granting powers to a new British Virgin Island-registered company to take mining leases across the island. 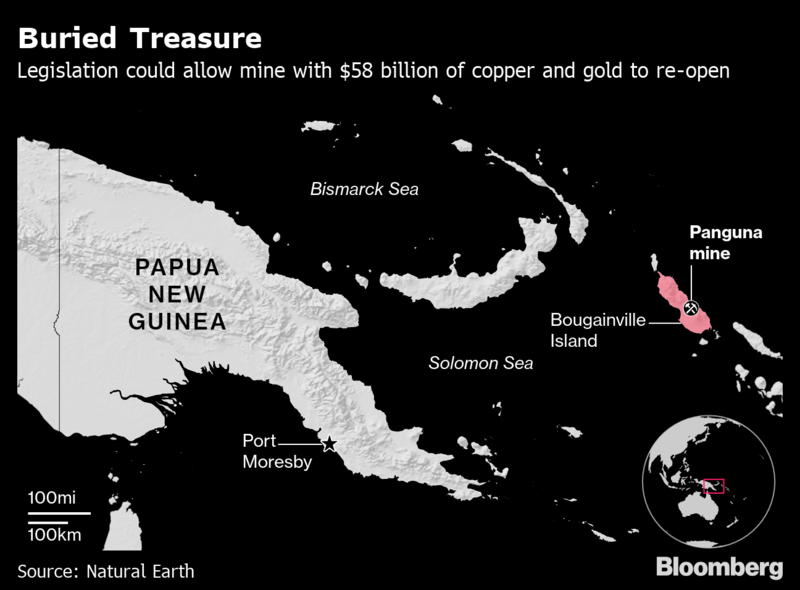 The changes to the mining law come as Bougainville moves toward an independence referendum as soon as this year, which may push it to seek new revenue streams to replace current subsidies from Papua New Guinea. The Panguna mine has an estimated 5.3 million metric tons of copper and 19.3 million ounces of gold, according to BCL, worth about $58 billion at today’s prices, according to Bloomberg calculations. When it was operating, Panguna was one of the largest mines in the world and accounted for 44 percent of Papua New Guinea’s exports, according to BCL. Protests by communities demanding greater compensation for absorbing the impacts of the mining operation turned violent in 1989 and revitalized an independence movement, prompting BCL to shut the mine and the Papua New Guinea government to send in troops. A peace agreement in 2001 set up the region’s autonomy and paved the way for an independence vote. In a separate filing Monday to the Australian Securities Exchange, BCL also said that Bougainville Advance Mining will be 40 percent controlled by Caballus Mining, which it said is owned by Jeffery McGlinn and “and other unknown foreign investors and sovereign states.” Caballus and McGlinn could not be reached for comment. market capitalization of about $44 million, estimates that it would take seven to eight years and $5 billion to $6 billion to resume operations. Rio Tinto Group, which controlled BCL when it operated the mine from 1972 to 1989, gave away its stake in 2016, effectively abandoning the mine for no gain. That left the governments of Papua New Guinea and Bougainville with 36.45 percent each of BCL.